The Gulf Centre for Human Rights (GCHR) has received information concerning the arrests and detention of Bedoon rights activists Yousif Al- Zhairy and Khaled Al- Battah in recent days. These arrests form part of on-going harassment of the Bedoon Community at the hands of State authorities. 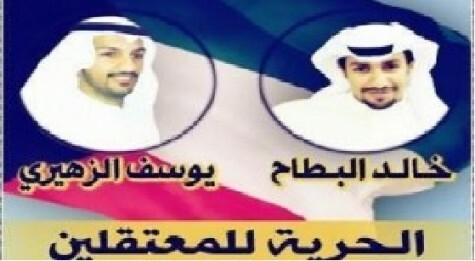 On 27 November and 25 November 2012 Yousif Al- Zhairy and Khaled Al- Battah respectively, were summoned to Sulaibiya police station where they were arrested. No grounds were provided for their arrest and no charges have been brought against them. The two human rights defenders are sharing a cell and it is reported that they will be detained for ten days as criminal investigations are carried out. Both Khaled Al-Battah and Yousif Al-Zhairy are peaceful human rights activists who have campaigned and protested for the rights of the Bedoon in Kuwait. Khaled Al- Battah was previously arrested on 2 October 2012 at a protest held in Taimaa Square near Kuwait City where approximately 3000 people gathered to demand equal rights for the Bedoon community. Security forces violently dispersed the protest and arrested nearly 30 protestors. The GCHR issued an appeal following the protest (http://gc4hr.org/news/view/256). It is feared that more Bedoon activists are at risk of being arrested as preparations for another protest are underway. The arrests of the two human rights defenders come in the context of on-going harassment of the Bedoon community in Kuwait. Recently a TV crew from AlYoum TV was summoned by the Public Prosecutor and charged with breaching media law following the broadcasting of a show on 11 October 2012, which focused on the Bedoon issue and in which pro-Bedoon Kuwaiti activists Dr. Rana AlAbdulrazak and Bedoon Abdulhakim Al-Fadhli appeared. The five crew members are out on bail as their trial is on-going. The GCHR expresses serious concern at the continued violation of the rights of the Bedoon community in Kuwait. The GCHR believes that the arrests and detention of Yousif Al- Zhairy and Khaled Al- Battah are directly related to their peaceful human rights activities as they campaign for justice and human rights for the Bedoon community in Kuwait. The GCHR expresses further concern at the charges brought against the TV crew of AlYoum and views such an action by State authorities as a violation of the right to freedom of expression. The GCHR respectfully reminds you that the United Nations Declaration on the Right and Responsibility of Individuals, Groups and Organs of Society to Promote and Protect Universally Recognized Human Rights and Fundamental Freedoms, adopted by consensus by the UN General Assembly on 9 December 1998, recognises the legitimacy of the activities of human rights defenders, their right to freedom of association and to carry out their activities without fear of reprisals. We would particularly draw your attention to Article 5 (b) which states that: “For the purpose of promoting and protecting human rights and fundamental freedoms, everyone has the right, individually and in association with others, at the national and international levels: (b)To form, join and participate in non-governmental organizations, associations or groups;” Article 6 (c) “Everyone has the right, individually and in association with others: (c) To study, discuss, form and hold opinions on the observance, both in law and in practice, of all human rights and fundamental freedoms and, through these and other appropriate means, to draw public attention to those matters” and to Article 12.2, which provides that “the State shall take all necessary measures to ensure the protection by the competent authorities of everyone, individually and in association with others, against any violence, threats, retaliation, de facto or de jure adverse discrimination, pressure or any other arbitrary action as a consequence of his or her legitimate exercise of the rights referred to in the present Declaration”.